It's a question as old as the hills: what happens to us after we die? 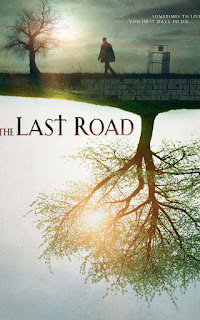 THE LAST ROAD presents a bleak, yet unique prospective on those postmortem possibilities. In his independent British film debut, writer/director John Wheeler constructs a dark, desolate landscape filmed in the English town of Westbury. Wheeler creates a gloomy panorama of dread; a macabre terrain sparsely inhabited by the unfortunate miscreants deemed unworthy of God. It has elements of a post-apocalyptic horror film, but might be more accurately described as a dark drama with splashes of lively gore. The bulk of the film focuses on a young fighter named Toby who scrutinizes the events of a life unfulfilled as he adjusts to his new existence trapped in limbo. Toby is played by the talented Aaron Long, who makes a strong acting debut in this picture. Toby is a fighter in an underground MMA-type of illegal fighting organization run by British gangsters. He is an outcast in a cesspool filled with unsavory characters who use and abuse him to sway the outcome of fights. Toby's shrewdness as a fighter ultimately costs him, as he eventually meets his demise in the ring against a maniacal opponent. Long, incidentally, is credited as the stunt coordinator; but the violence depicted (in the few fights that are shown) is not necessarily as brutal or realistic as say, FIGHT CLUB, or THEY LIVE (R.I.P. "Rowdy" Roddy Piper who has tragically passed away as I write this entry - http://www.examiner.com/article/roddy-piper-discusses-the-big-fight-scene-john-carpenter-s-they-live ). The fight sequences are composed of many quick-cutting shots lasting only a second or two before moving to a different angle, so it's difficult to have time to absorb the impact of the blows. Post-fight we follow Toby's journey into the afterlife. He is met by a guide who determines his fate based on the nature of his lifelong deeds. Toby subsequently sets off crestfallen and bewildered into a new trippy and bizarre environment. Wheeler fabricates a truly outlandish locale in which Toby is tormented by visions of his past life and loss of faith; while meeting an assortment of similarly doomed souls along the way. Long gives an emotional performance and impresses throughout, showing a range and intensity rarely seen in actors with such limited acting experience. While the overall acting is good, the direction is choppy and at times blatantly disorienting. The editing process must have been a nightmare. The first hour of the movie seems to not have a single camera shot that lasts longer than 4 seconds. When he's not incessantly cutting to a different angle (imagine an annoying techno music video), Wheeler overuses avant-garde landscape shots which are routinely accompanied by a droning monotone musical score. Doing away with the excessive shots of time-lapse clouds, windswept trees (a la the boring pretentiousness of Terrence Malick/Lars Von Trier) and other unnecessary visual digressions could have cut this nearly two-hour beast into a more enjoyable 90 minute viewing. Nevertheless, Wheeler's vision yields a striking and ambitious first effort. 2 out of 4 stars.